I thoroughly enjoyed the first game and am equally, if not more addicted to TM 2. There is a deeper level of strategy with the enhancements in TM2 - a choice of building hotels, supermarkets or factories, with different returns. You can buy and sell shares in increments of 25% in other companies and eventually buy out another company. There is also a casino if you fancy a flutter. As with the first game, you can trade with goods and there are cards to help. Another excellent game. I loved Trade Mania and this is a great sequel. I liked the option to build factories, supermarkets or hotels as this adds another element of strategy to the game. 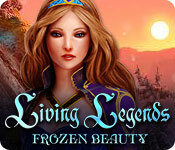 A refreshing change to all the hidden object games. Different cities and now you can build Factories or Supermarkets instead of just hotels. If you're like me and like Monopoly you should try this. I absolutely adore Trade Mania 1, it's one of those games I go back to every now and then and enjoy for a week or two... I've just finished the game for about the 10th time and I still enjoy it and feel challenged. 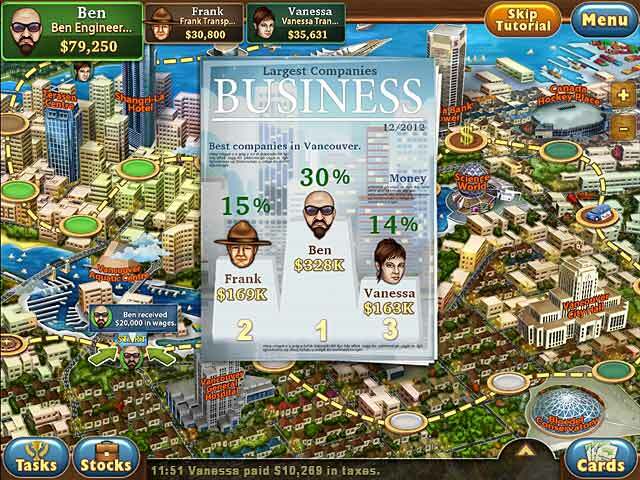 Trade Mania 2 has the same premise - you move around the board, buy properties, upgrade them, buy goods and sell them for a profit all while trying to beat your competitors. It sounds simple, doesn't it? It's not. The mechanics of the game are easy to learn, but you have to develop a real strategy to beat your competitors. Some buy up properties as fast as they can, others trade and trade to build up stockpiles of cash then buy larger properties, some do something completely different. It's up to you, and the trial and error part of it just makes it so much more fun! 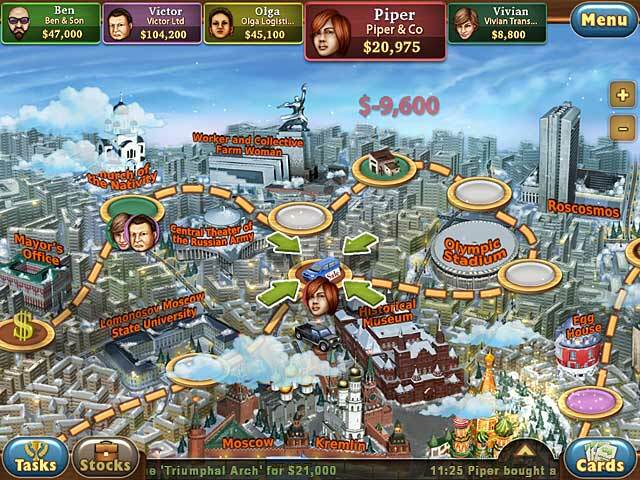 *** Despite the name, Trade Mania is not a fast click fest, it is a strategy game, not a time management one. Each level can take anywhere from an 1hr to 3hrs to complete depending on how quickly you move it along or what they throw at you! I wholeheartedly recommend this game! If you like board games - this might be a nice addition. I found it very relaxing and interesting, without skulls, villains or dark scenes or other excitements. As a different genre to HOG, building games or timemanagment it is quite interesting. I liked Trade Mania 1 and played it many times. 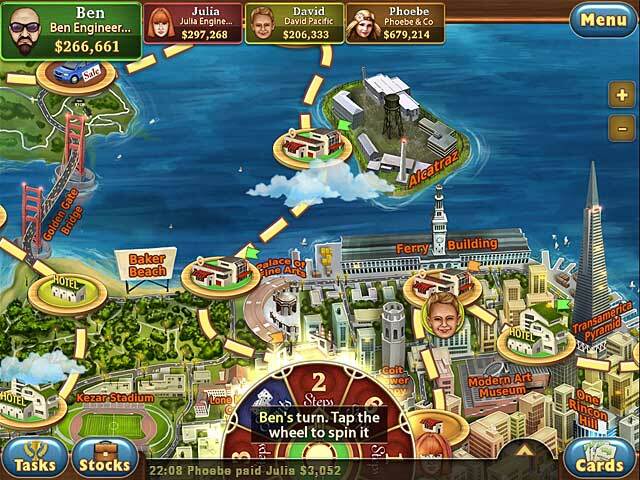 It is monopoly style with some more features like trading goods. In Trade Mania 2 there are some new features like a casino minigame, which I really enjoyed and new opportunities for buildings like supermarkets or factorys. The graphics also improved, so its worth a game credit for me, as I know I will be able to play it over and over again like I did with TM1 before. This is not your ordinary Monopoly game . 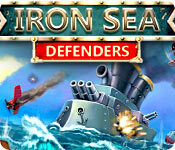 This is a strategy game. You must figure out when to buy and sell products. You need to determine when to build a hotel, factory or supermaket, for the best profit.Buying stock in others company is the only way to win. I loved this game. If you want a challenge this game is for you.